Please don’t buy my new book! That is, if you subscribe or intend to subscribe to my newsletter. As a token of my appreciation, I offer my brand-new release, Season of Mercy, to my subscribers free. Of course, if you’d like to buy it here, who am to question such a kind gesture? I didn’t intend to write this kind of book. Don’t get me wrong. 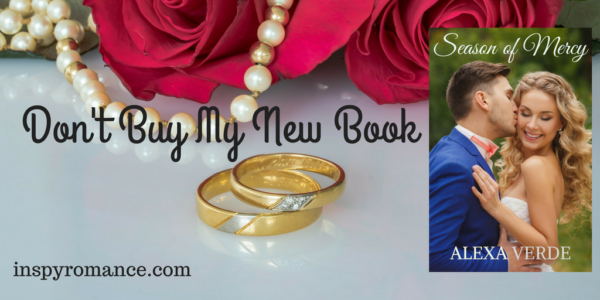 I wanted to give a book as a gift for some time, and I knew it would be a contemporary Christian romance, sweet and heartwarming. But I never thought in my life that I’d write a marriage of convenience story! Then one day I had a calling. I could see these people in my mind’s eye who deserved a happily ever after, and the only way their story would work was in a marriage of convenience. I told myself that it was something new for me, that my readers might not like it, that I should continue to pen stories I knew through and through. But the longing to write Season of Mercy wouldn’t go away. So I took a deep breath and wrote it. I loved every minute of it. Is a modern marriage of convenience the second chance they need or a road to heartache? Left widowed, destitute, and emotionally hurt, Mercy Grant doesn’t intend to remarry, much less to a known player like Ethan Echeverría. Never mind that he’s her one-time teenage crush and a longtime friend. But when her son, Stevie, needs an expensive surgery, risking her heart is a small price to pay for her little boy’s happiness. Ethan Echeverría leaves women before they have a chance to leave him the way his mother once abandoned him. Then his dad gives him an ultimatum: get married and become the owner of the family auto shop chain or stay single and lose it. Considering Ethan has always cared for Mercy, getting married might result in more than ownership of the shops and a loving father for Stevie. It could be the second chance they need. Their feelings toward each other grow, but so does Mercy’s jealousy. When Ethan’s past crashes into his future, will she end up heartbroken and alone again? I find getting myself out of my comfort zone again and again lately. I started designing my covers. I’m learning formatting, and that’s not easy for a non-techy girl like me. And now I’m publishing the type of story I never thought I’d write. I don’t like change. I don’t enjoy learning new things as much as I used to. But sometimes one has to take a leap of faith and try it. It might bring more joy than expected! I was recently asked to read in front of a lot of people. Public speaking terrifies me, especially considering I have a very heavy accent. I really want to say yes. But what if people wouldn’t understand me? Do you like trying new things? If so, what did you try lately? Or do you have to get out of your comfort zone and just do it? P.S. And if you’d like to read Season of Mercy, please click here to download it. Note you’ll be subscribed to my newsletter, but never fear: you can unsubscribe at any time. I do hope you’ll stay because I enjoy connecting with my readers and offering gifts and giveaways. Hi Alexa, your book sounds good, I look forward to reading it. I don’t mind trying new things- I guess it depends on what it is I am trying as to whether I am going outside my comfort zone or not!! As my boys grow bigger, I feel like I am constantly trying new things- exciting and scary at the same time!! Hello, Wemble! Thank you very much for the kind words about my new book! And that’s the way I feel about trying some new things, too: it’s exciting and scary. Thank you very much for your input! Hello Alexa! Your new story sounds inspiring. Over my lifetime, I have tried many new things. Moving into the computer age in the 1980s was huge, but I would not go back. Not always easy to change, but to keep up with kids, grandkids, and society it had to be done. Keeps a person young. Best wishes and happy writing. Hello Renate! I totally agree, change is difficult, but it has to be done, especially when it comes to computers and technology. To be honest, sometimes I miss simpler days of my childhood. Thank you so much for your kind words about my new book! Best wishes to you, too! Thanks for the book. I’m looking forward to it. I’ve learned how to use the computer, smart phone, and a tablet. I resisted at first, now I use them all the time. We’ve moved to a new state recently, I’m still getting used to that. I do like things to stay the same, but life keeps moving. I’m sure you would do well with public speaking, as a speech therapist told my husband, just don’t speak too fast. God bless! God bless you, Diana! Moving, especially to a different state, is difficult. I moved many times in my life, and it was so much work. Thank you for advice! My natural manner of speaking in all languages I know is very fast, so I need to remember to slow down. I hope you’ll enjoy Season of Mercy! Sounds like an excellent story, Alexa! I can’t wait to read it! Thank you very much for your kind words, Brenda! I hope you will enjoy reading my new book. Change isn’t easy, and hugs and prayers for everyone dealing with a little more than feels comfortable ! Autumn, I’m joining you in prayer. And you are so sweet and encouraging, Autumn! Frankly, I’m developing many of those skills thanks to you! Sounds very intriguing! Thanks for the gift! When I’m going somewhere new, I like to research a lot first :-) Same with doing something new. Hello, Margaret Nelson! Thank you for your kind words about my new book. It’s a good idea to research new places before going there. I think one gets a much better experience that way! This sounds like a great book – I’m glad your going outside your comfort zone! Hello, Julianne Archer! I appreciate your kind words about my new book. And I often resist to leave my comfort zone, too, even more now than in the past. Thank you very much for sharing! I got way out of my comfort zone when I traveled to China 5 years ago, to visit with friends who were teachers over there. Unfortunately, they both retired and moved back to the States or I would probably go back. Thanks for the gift of your new book. Hello, Janet! Travel to China sounds fascinating though definitely something out of comfort zone. I’m glad you had the chance to do it. And I hope you will enjoy reading my new book! I’ve never traveled to China but would be so interesting to do it one day! I love marriage of convenience stories! They are some of my favorites and I look forward to reading Season of Mercy. Thank you so much for offering it to your new subscribers! Hello, Brittany! I appreciate every one of my subscribers, and I’m happy to offer them a gift. Thank you for your kind words, and I hope you’ll enjoy reading my new book! I truly loved writing it. My pleasure! I hope you will enjoy reading my new book! I am an introvert but loved a life of moving and change. The older I get I find myself not liking change and being uncomfortable around people. This is why I read so much. This was a nice blog post,Alexa. Hello, Linda! I’m so blessed to have a friend and a reader like you. Thank you very much for the kind words about my post! I feel the same way: the older I get, the more I resist change. Trying new things used to be so much easier when I was in my twentieth! This looks like a great book. Thanks for making it free! I tend to stick with the tried and true instead of trying new things. Hello, Elizabeth! You are very welcome about the free book! I hope you’ll enjoy reading it. Totally understand about sticking with the tried and true! I love historical marriage of convenience stories but have never read contemporary ones before. I guess I never think it happens in today’s world so your story would be intriguing to me! Hello, Trixi! Thank you so much for sharing. And so true! I love trying new food (unless it’s something spicy). But meeting new people? I get scared, unless it’s online where I love to meet new people. And yes, a marriage of convenience in today’s world sounded a bit strange to me, too. Until I decided to write one! I can’t wait to read your book! Sometimes I’m not bad at trying new things, However, God seems to often take me out of my comfort zone. I could be easily content to just stay at home – and read! Hello, Becky! I hope you will enjoy reading my new book! And thank you for your input. Sometimes I think if it were up to me, I wouldn’t leave home for days. I believe sometimes I haven’t! Good Morning, Thank you so very much for the book! I look forward to reading. You know I really do not like change. Not even moving my furniture! Not sure why. But early on I learned that one of the things that is constant is change. So I have embraced it as much as I can. I do like doing new things and have branched out this past year. I work at home so it is easy to just stay in my comfort zone! Good morning, Lori Dykes! I loved how you said it that one if the things that is constant is change. That is so true! And I don’t like moving furniture, either. I believe the only time I moved the furniture was when I had to move into a different place. You’re welcome about the free book, and I hope you will enjoy reading Season of Mercy! Thank you for the freebie. I’m looking forward to reading it. I’m not one for venturing much outside of my comfort zone. I need to be better about doing it. Hello, Alison! You’re very welcome, and I hope you’ll enjoy reading it. I can totally understand about not venturing much out of comfort zone. Thank you very much for stopping by! Thanks so much for your new book! It sounds great! I like to reside in the comfort zone and don’t really get along with change! However, my sister can usually talk me into trying something new every once in a while. I put up a fight but usually go along with her. Hello, Jenny! I’m glad you like my new book. It’s good to have a sister or a friend who makes us get out of our comfort zone! Thank you very much for commenting! I am not good at new things. For example, any new food, I make my husband try it and tell me if I’ll like it before I’ll even think about it. Hello Katherine! Food is one thing I can be adventurous at, but not much else. Thank you so much for stopping by! I like the change 😊 a good change of course and challenges that come with it make life interesting 😊 but I seek God’s will first!